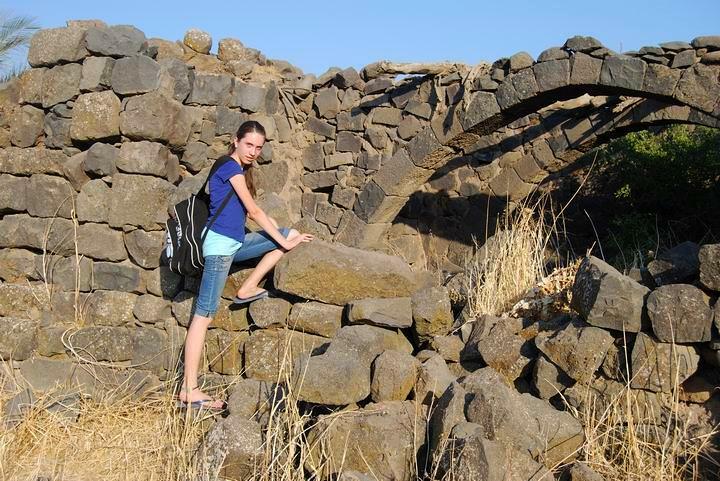 Ruins of a Roman village located in the central Golan heights. 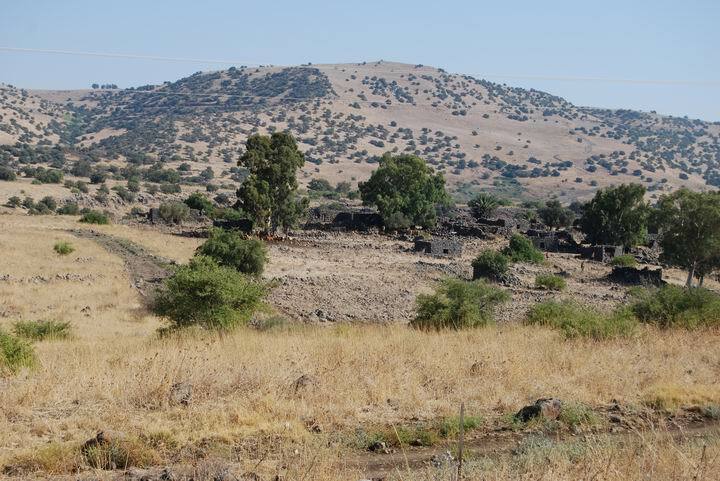 This site is identified as Sogana, one of the villages that were fortified during the great revolt against the Romans. 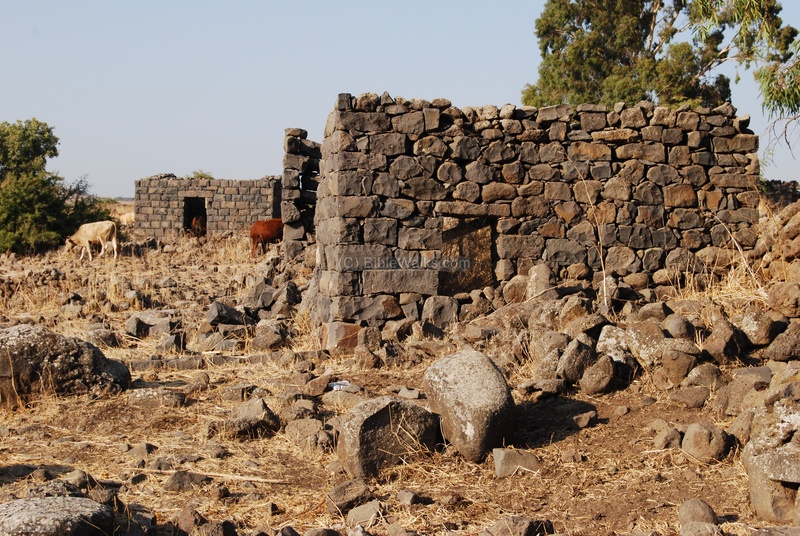 Josephus Flavius, War 2: 20: 6: "...in Gaulonitis he fortified Seleucia, and Sogane, and Gamala"
Ruins of a Roman village located in the central Golan heights. The village, identified as Sogana, was fortified by Josephus Flavius during the Jewish revolt against the Romans (67AD). The site is located on the south side of road #87 (Katzerin to BethSaida). It is easily accessed form this road. 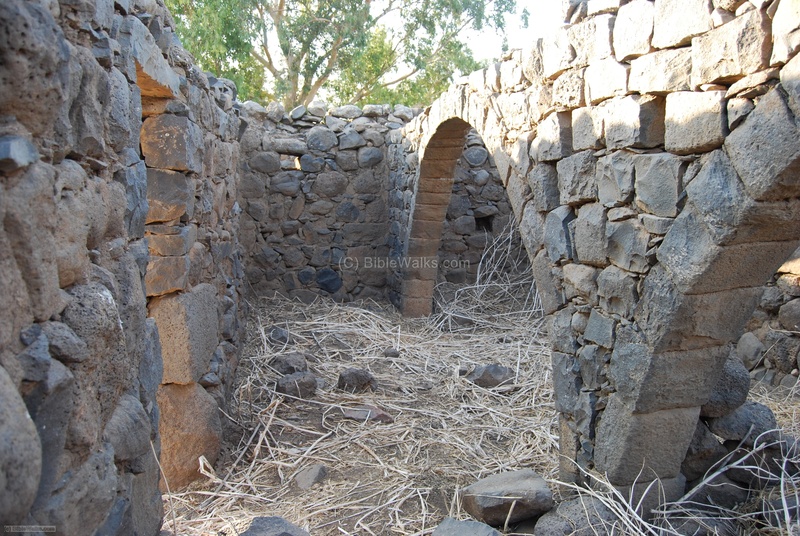 The ancient village is situated on the Yehudiye creek, and is close to the Zavitan creek on its north side. Around the site is a large number of Dolmens (prehistoric megalith tombs), indicating that this area was populated during the early middle bronze period (about 30 Century BC). The tombs may have been of nomad tribes who buried their dead in central holy places such as the area of Yehudiye. The area of the southern Golan heights saw a dramatic increase in the number of Jewish villages in the end of the 1st Century BC, at the times of King Herod, from virtually none - to 20 or more villages. The reason was due the fact that King Herod received the area from Augustus Caesar and relocated Jewish settlers to this area in order to populate his new territories. This site was probably one of the Jewish villages that were established at this time. A number of carved stones with Jewish symbols - including a five-branched menorah - were found in the village, which may have been part of a synagogue. The villages were based on agriculture: fruits, sheep and crops. They were established in sites with sources of water (natural springs), since the Golan heights are like a desert and the summer is very hot and dry. During the great revolt against the Romans (66-74AD) some of the Jewish villages participated in the revolt. According to Josephus Flavius, the commander of the Galilee army, he fortified three sites with walls and towers - Sogana, Salukiya and Gamla. 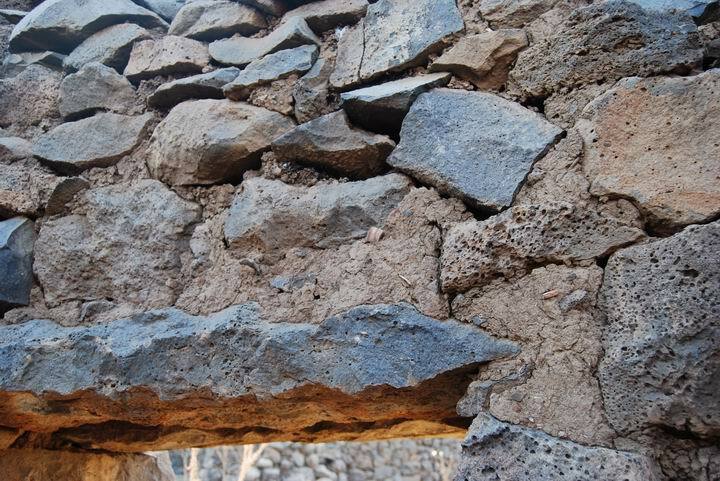 Here, at Sogana, the walls are visible on the south and the west sides, and traces of a tower are on the south side. The Romans destroyed Gamla but spared the other two villages after they surrendered without a fight. Other revolts (131-135AD, 351AD) also caused severe damages to the villages, but they rebuilt and continued to prosper. The ancient Jewish village reached its peak in the Byzantine periods (4th-6th C AD) as most of the other villages in the Holy Land. The Jewish villages were demolished in the 6th C AD after the Persian and Arab invasions. During the 19th-20th C AD (Ottoman period) new Arab settlers, mostly Torkmens, resettled in the site. They reused the hewn stones and architectural elements from the ancient villages in order to build or rebuild their new houses. 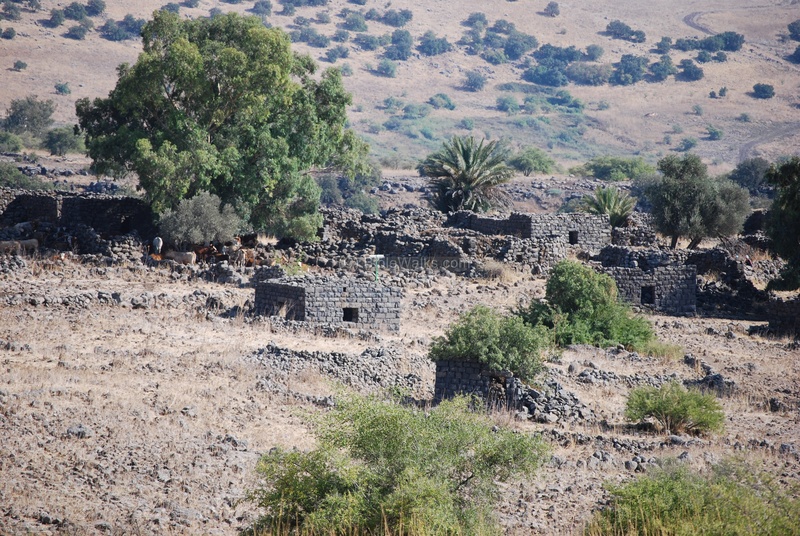 Within the ruins of the Byzantine village the new settlers established a new Arab village called Yehudiyeh (and later renamed Arabiyeh), which existed until 1967. Before the war the Syrians attempted to divert the sources of water from the Sea of Galilee, and their canal passed 2KM south to the site. 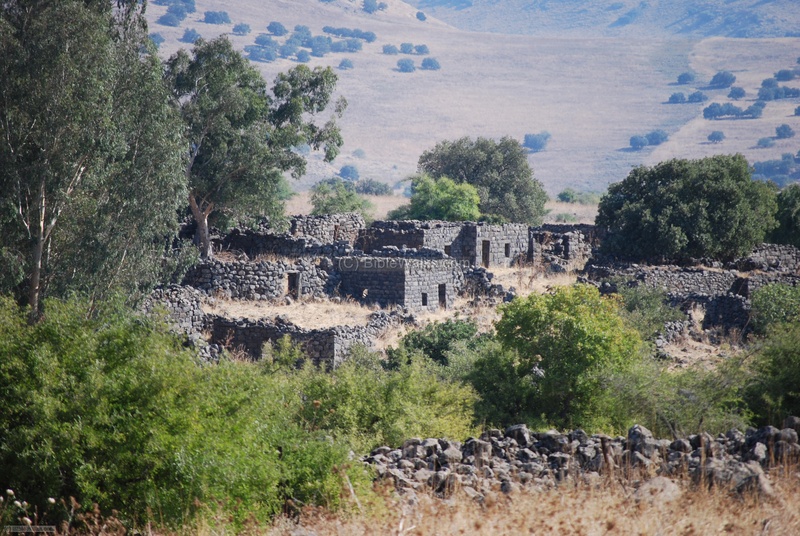 After the war (1967), which resulted in the conquest of the Golan heights by Israel, the villagers (about 100) left to Syria, and the village is since vacant. 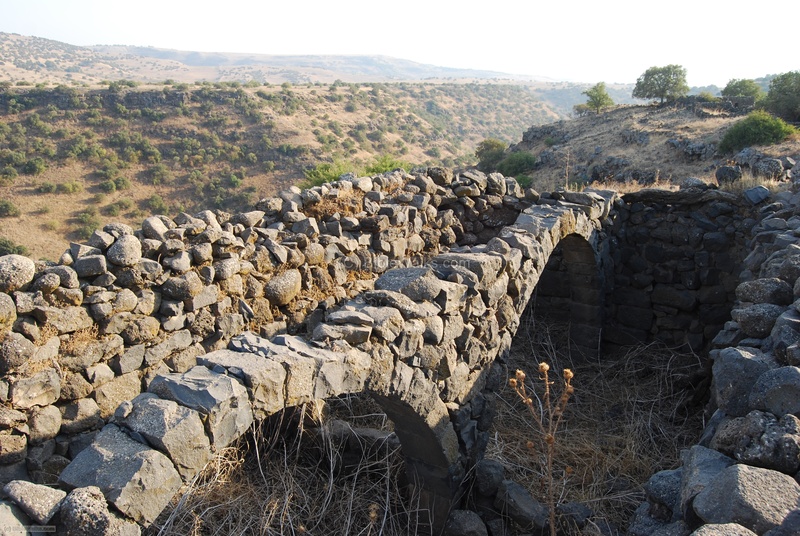 It is today a starting point for hikes to the Yehudiye and Zavitan creeks, the most popular hiking routes in the Golan heights. According to scholars, the site may have been the village of Sogane or Sogana (see references below). This identification is based on the existence of a wall, which Josephus constructed on the eve of the Roman attempt to crush the Jewish revolt. The Arabic name - Yehudiye - preserved the fact that this village was once a Jewish village. An aerial view, as captured from a quad copter from the north side, is seen in this photo. The village is located on a ridge, with a deep valley on its south side. The photo shows the west side of the village, from the ground level at its north-west side. The site is located in a large nature reserve park - the Yehudiye Forest. The following photo shows a closer view of the north side of the village. The houses date to the 19thC, but were built on the basis of the stones and houses of the Roman-era village. The next photo takes a closer look into the village. Notice the cattle between the abandoned houses. This is the main north-south street between the houses. There are several dozens of houses built on both sides of the road. Josephus Flavius fortified the city during 67-68AD, as a preparation of the Romans attacks during the great revolt. The village's weak points were on west side, seen below, where he added a wall. Parts of the wall can be seen along the hillside of the village. On the east side of the village is the deep Yehudiye valley, which is a natural defense that did not require any fortifications. The panoramic photo below shows how deep the valley is, as seen from the village (looking towards the east). The houses were built along the edge of the cliff. All the houses, which were rebuilt in the 19th C using the earlier stones, have similar designs, such as seen below: a small rectangular house with an inner set of arches which holds a wooden roof. 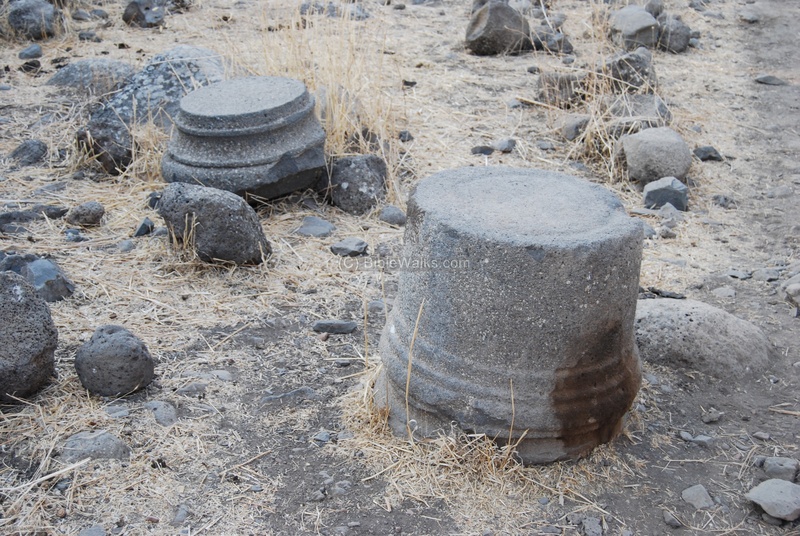 Within the village there are a number of large stones that may have been parts of a synagogue: columns, bases, doorpost and even a hewn stone with an inscription of a 5-branch candelabrum. The interior design of all the Ottoman-period houses is common and simple: a small rectangular house, divided with a set of arches which held the wooden roof. The stones, most of them reused from the original Roman houses, were laid one on top of each other. A mixture of mud, hay and fragments of Roman ceramics held them together. 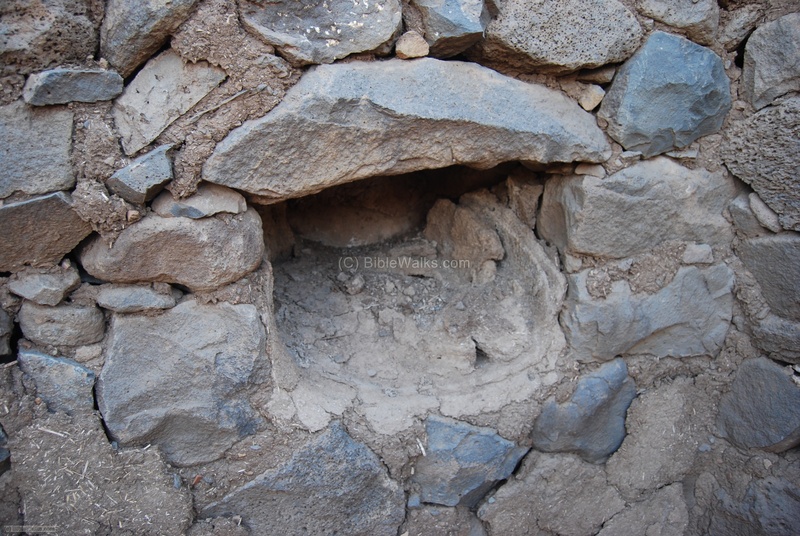 In one or two sides of the walls there are is a built-in stove, where the meals were cooked. 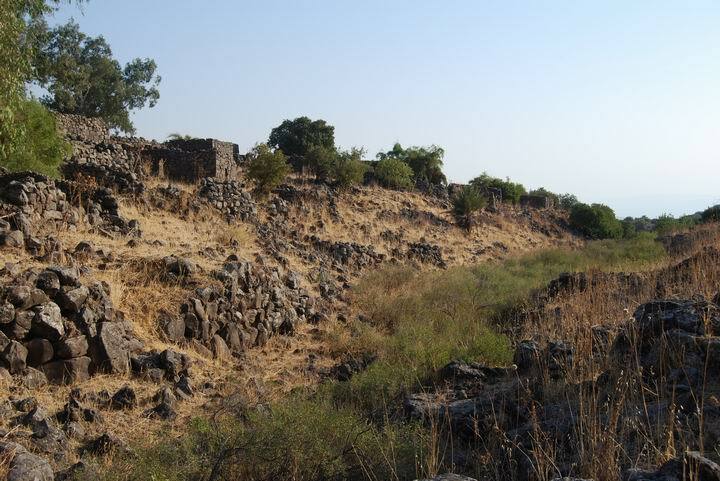 In this text the historian Josephus, the commander of the Galilee Jewish army during the revolt (67-68AD), tells about the fortifications he prepares in the area of Golan (Gaulonitis), including the walls he built in Sogane/Sogana (Yehudiye). "Josephus also, when he had settled these rules for determining causes by the law, with regard to the people's dealings one with another, betook himself to make provisions for their safety against external violence; and as he knew the Romans would fall upon Galilee, he built walls in proper places ... in Gaulonitis he fortified Seleucia, and Sogane, and Gamla". In this text Josephus tells us that Sogana surrendered to the Romans. King Agrippa II, which sided with the Romans during the revolt, saved it from the fate of its sister village Gamla which was destroyed after a fierce siege. "Now all those Galileans who, after the taking of Jotapata, had revolted from the Romans, did, upon the conquest of Taricheae, deliver themselves up to them again. And the Romans received all the fortresses and the cities, excepting Gischala and those that had seized upon Mount Tabor; Gamala also, which is a city ever against Tarichem, but on the other side of the lake, conspired with them. This city lay Upon the borders of Agrippa's kingdom, as also did Sogana and Scleucia. And these were both parts of Gaulanitis; for Sogana was a part of that called the Upper Gaulanitis, as was Gamala of the Lower; while Selcucia was situated at the lake Semechouitis, which lake is thirty furlongs in breadth, and sixty in length; its marshes reach as far as the place Daphne, which in other respects is a delicious place, and hath such fountains as supply water to what is called Little Jordan, under the temple of the golden calf, where it is sent into Great Jordan. Now Agrippa had united Sogana and Seleucia by leagues to himself, at the very beginning of the revolt from the Romans; "
Amit, Webmaster Rotem's sister, in front of one of the houses on the east side.